Heirloom Tall Bearded Iris "CATERINA"
Perhaps one of my great finds in New Zealand this year is an Heirloom Iris of significant historical importance growing in an Auckland garden. Sir Michael Foster is justly looked up to as the pioneer and founder of the modern cult and cultivation of the Iris, and in 1888 he crossed I. pallida with I. cypriana, both of these irises at the time being considered collected wild species. The result, a selected seedling 'Caterina' (named after the Queen of Cyprus) was introduced. 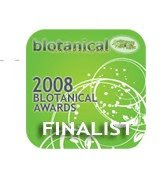 It was one of the first tetraploid hybrids, and proved to be invaluable for introducing plant size, vigour, plants with taller well-branched stems, and larger flowers to the world of tall bearded iris breeding. The hybrid vigour of this hand-cross produced seedlings that in comparison to the predominant diploids of the day were spectacular. Many of the early pioneers of tall bearded iris breeding, including Amos Perry, Geoffrey Pilkington, Sir Arthur Hort, George Yeld, Louis Dennis, Grace Sturtevant, B. Y Morrison, William H Mohr, the Sass Brothers, Edward Essig used 'Caterina' in their breeding, making it an ancestor of some of the best irises. As an example, William Mohr used 'Caterina' in a cross with I. mesopotamica to raise a seedling he named 'Argentina' (1923) which he then crossed to 'Conquistador', (1923) (Juniata X I. mesopotamica) to produce 'Purissima' (1927) . This was considered to be one of the all time greats in the colour white and was used extensively in hybridising. When 'Purissima' was crossed with 'Thais' it passed on its genetics plus its pure white colour to the outstanding tall bearded iris 'Snow Flurry', (1939). Seventy years ago this must have seemed like a miracle in outstanding hybridisation. When I sent the above photo to Phil Edinger for conformation of its identity, his informative reply was , “CATERINA! And a very nice shot of her, too!! One almost-diagnostic feature is the stalk. Often, as it elongates, the upper part will bend over. Sometimes it remains that way to some extent, with the terminal blossom at an odd angle. More frequently, though, the stalk will recover from the bend and grow upright but leave a bend or "crook" in the stem. The "official" description in AIS Bulletin 6 notes "stalk apt to be flexuous." 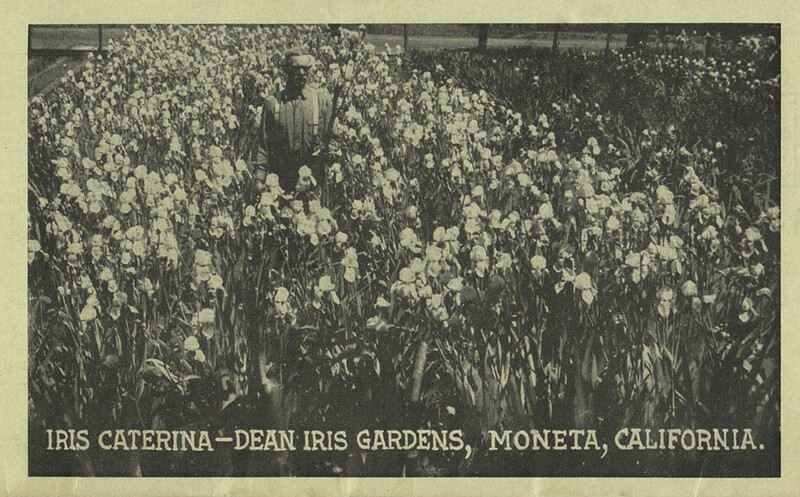 The Dean lris Gardens, Growers and Importers of Choice Iris, 1914 Catalog, Moneta, California. THE late Sir Michael Foster, of England, devoted many years to the study of the Iris, collecting from all parts of the world wherever they are to be found-and also produced a large number of hybrids. Had he been trying to produce an Iris among his hybrids, particularly adapted to our climate, he could not have done better than when he gave us Caterina. It is a queen among Irises beautiful for any climate. "A lovely hybrid raised by the late Sir Michael Foster, from I.Cypriana and I. Pallida; the flowers are of great size and borne on long, stout branching stems, standards light clear blue, falls soft lilac-blue, delicately fragrant, 4½ feet. Award of Merit R.H.S." "A very pretty hybrid, one of the very best of the late Sir Michael Foster's pets; a cross between Cypriana X Pallida, having large, conspicuous pale mauve flowers, with a brownish marking at base and a very conspicuous yellow beard. A.M., R.H.S." The foliage being persistent throughout the year, the plant is ornamental at all times, with its broad leaves some two feet tall. The growth of the plant being checked a part of the year in colder climates, no doubt the blooming period is not as long as it is with us. It comes into bloom here about the 6th of April, and with proper care remains in bloom for two months and more. Our own stock, although divided last year, has not been without bloom for three months and is still making new flowering stems at this writing. The flowers are borne on branching stems, some four feet tall; most of the stems produce from fifteen to twenty blossoms, often five flowers being open on a stem at a time. The flowers measure 5½ inches from top of standards to bottom of falls. The plants do not throw up a quantity of flowering stems simultaneously, as many Irises of this class do, but instead seem to court our attention and admiration, by modestly extending their blooming period over such a long season. We can confidently recommend it to those who have room for but a few plants and want something choice, and also that will give increased pleasure from year to year, as well as to those with more ample space, and who can perhaps afford to plant more liberally of it. Our stock is guaranteed true to name. The price at which this Iris is held, both in Europe and by the growers in the Eastern States who list it, proves that its worth is appreciated. The grower from whom we secured our stock in England writes us that this plant is getting very scarce, and many forms are being sold, both in England and elsewhere, as Caterina. For this reason, and the fact that the stock does not multiply as rapidly as that of some of the more common bearded varieties, the price will not be much reduced for some time to come. Brief. Bluish lavender the falls slightly flushed lavender violet; S. fluted, tips touching; F. drooping; stalk low and well-branched; growth very variable; to 4 ft. Details. Haft reticulations broad, widely spaced, brownish; beard white.yellow tip; stalk apt to be flexuous. Remarks. A. M. R. H. S., 1907. Very fine in California but in the North it requires the most thoro drainage as it is subject to rot and winter killing. The Iris Society (BIS) Bulletin No.2 May, 1925 'Sir Michael Foster and his Irises'. 'Caterina (48ins., Foster, 1909), pale lavender, flowers large but a weak stem, often unable to hold itself erect;” and from page 232, 'In this country little had been done before 1900 to raise garden hybrids on a large scale. Foster had made a few experiments with new introductions and obtained such good hybrids as Caterina and Miss Willmott but they were produced rather as the result of other enquiries and not as an end in themselves'. A H Burgess and Son Waikanae Wellington 1926 catalogue. CORNELL MEMOIR 100, Study of Pogoniris Varieties, Austin W.W. Sand, July 1926. Color effect a bluish lavender to soft lilac, olive veined self: size large; form long, compact, rounded; flowering habit free ; tall bearded class; height 24-48 ins. ; branching fastigate, low to high, two laterals; A flower of good substance; firm texture; smooth surface; good fragrance; good lasting quality. Its delicately colored, large sized blooms make excellent cut flowers and build up well in mass or specimen clumps. A most fragrant variety. S. light lavender, reticulated with olive on the yellowish claw, carriage ad-pressed to arching; blade obovate, notched, undulate, ruffled, revolute, slightly cockled; size 2 in. wide, 3 in. long. F. lavender-violet, with whitish outer haft, widely reticulated with olive, becoming brown on the yellowed haft; carriage widely drooping; wedge shaped convex, oblong ; size 1⅞ in. wide. 3⅛ in. long. Minor parts; beard coarse, sparse, projecting, white tipped with yellow; haft very broad channelled; reticulations broad, close to widely spaced; style-branches medium broad overarching; crest small fringed; pollen plentiful; spathe-valves scarious. Growth moderate; increase slow to rapid; habit compact; foliage stiff, leaves broad, deep glaucous green; 2 blooms open at once, floriferous; stalk angular, slightly flexuous, with six or more buds. An I. trojana or I. cypriana X I. pallida hybrid. Requires a well drained situation. A Major Hat Tip to Audrey McCarrison for growing an iris she loves, and also to Phil Edinger for the interaction of thoughts and discussions concerning 'Caterina'. Perhaps one of the great outcomes when finding historic irises is the sharing of information and the friendships that are formed with those genuinely interested in historic Irises. As referred to above the merits and all the exciting contributions that Snow Flurry" made to the world of modern tall bearded irises will be elaborated in a separate post at a later date. Clicking the above image will automagically take you to the larger, higher resolution version. 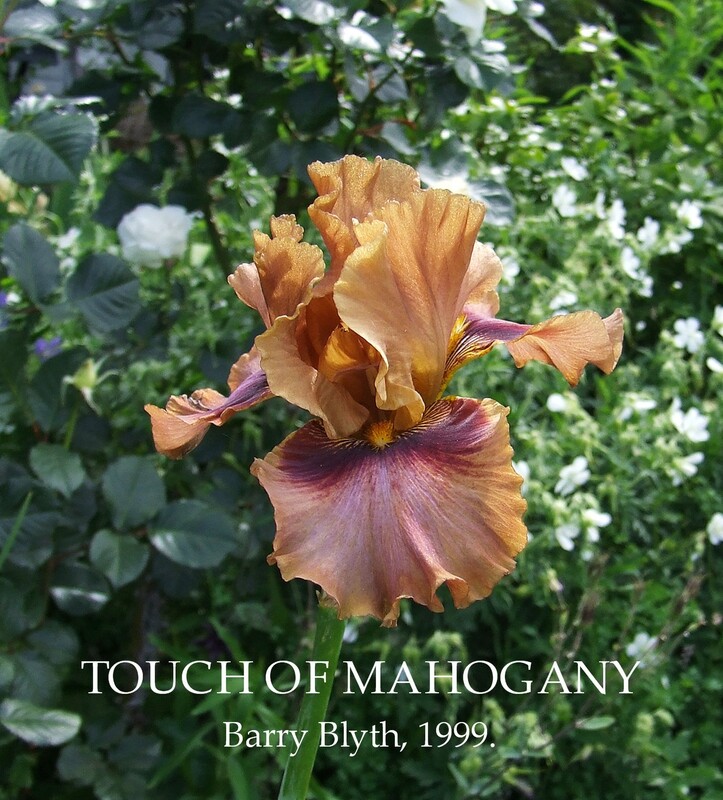 Barry Blyth's, 'Touch of Mahogany' is a totally different look with its varying tones of russets, browns, and ruby red burgundy. Ruffling in the falls inherited no doubt from its very famous brown pollen parent 'Copatonic'. Certainly a surprise I like!!! Touch of Mahogany Blyth 99 ML 36" Standards are coffee-brown with slight gold infusion. Falls coffee-brown overlaid soft lavender with striking burgundy hafts rouged down each side of the old gold beards setting the whole flower alive. Good branching, show stems, and a fine parent. Chestnut Avenue X Copatonic. TOUCH OF MAHOGANY (Barry Blyth, R. 1999) Sdlg. E123-2. TB, 36" (91 cm), ML; S. coffee brown, slight gold infusion; F. coffee brown, overlaid soft lavender around old gold beard, 1" burgundy hafts; pronounced sweet fragrance. Chestnut Avenue X Copatonic. Tempo Two 1999/2000.